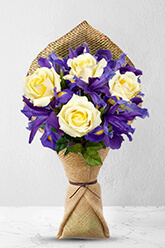 Artistically arranged centre-piecing five purple Iris surrounded by four pastel yellow Roses, this creative bouquet symbolizes purity, honesty and love.Vase not included however; if you wish to make a fantastic impression, may we suggest that you add the Premium Vase. Most standard floral orders delivered to metropolitan areas have a reduced delivery charge of 85.00HKD. I live in Austria. It was easy to arrange an order and the choice of flowers and timeliness of delivery were spot on. thanks zflowers. The flowers were delivered on the due date and in very good condition. Arrived exactly when they were supposed to, looked great. Thanks!